Many people ask me "what is autism?" or "what causes autism?" If I knew I would be a millionaire! That said, here is one of the best answers I've seen in a long time. 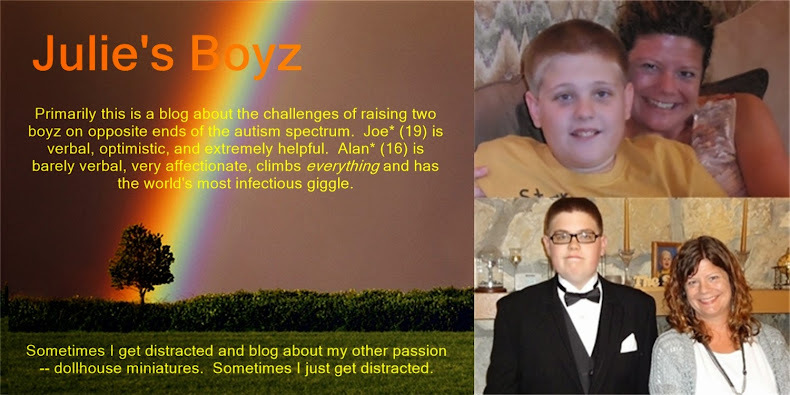 I do love my boys but I love them in spite of their autism not because of it. That said, there are perks to having two special needs kids. I do not worry about them getting anyone pregnant! I don't worry about them being out late at night. Most of the time Joe wants to be home and in bed by 9 pm. Of course, this is mainly because of the medication he takes which makes him sleepy. I don't have to worry about alcohol until age 21 or illegal drugs -- Joe is way too much of a rule follower for that. They don't need the latest clothes, games, or electronics. We get to have family dinners every night because they aren't running to a half a dozen (or more) weekly teams or activities. Of course, as I mentioned in one of my other posts, dinners with Alan are anything but restful!